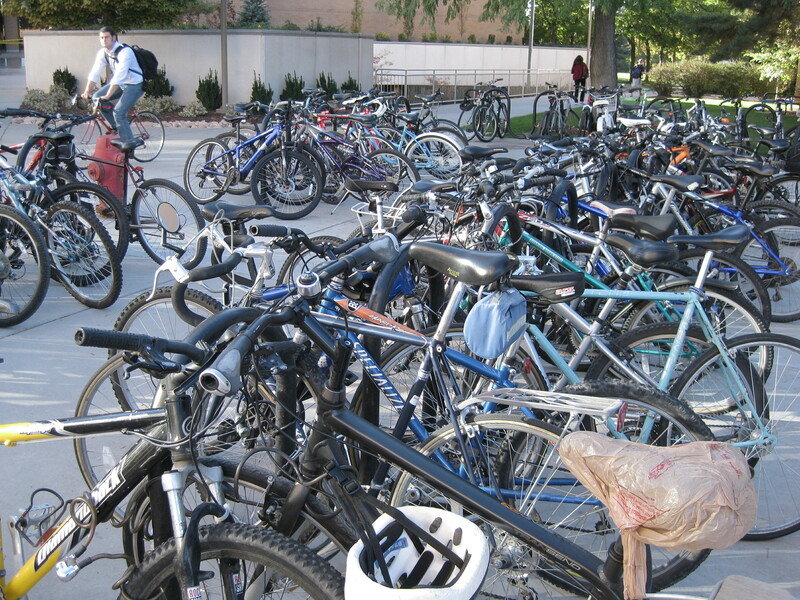 On this crisp autumnal morning, the BYU bike racks were still packed with bicycles. 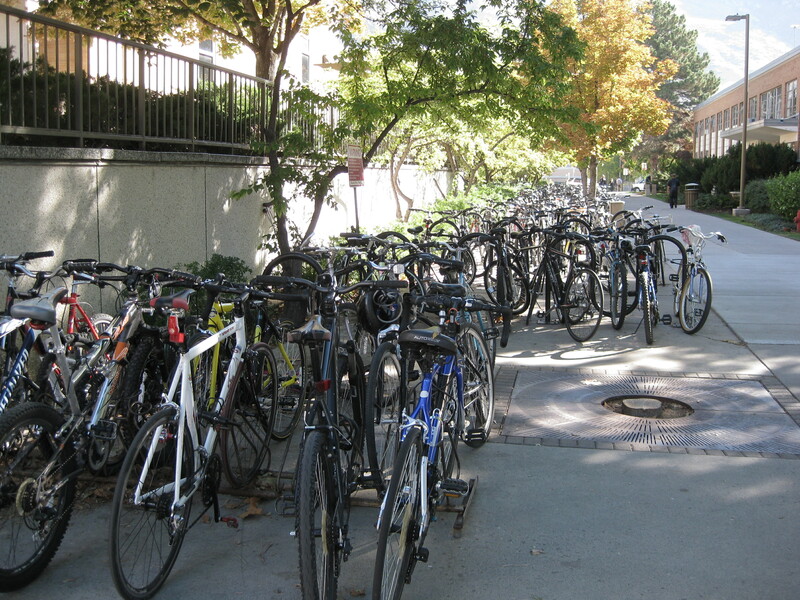 Here’s a glimpse of a few of the bike racks around campus and their capacity. 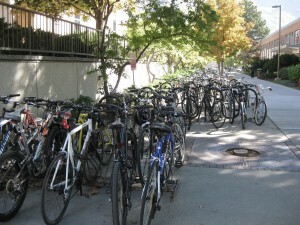 The packed bike racks by the SWKT. Bikes as far as the eye can see by the Wilk. 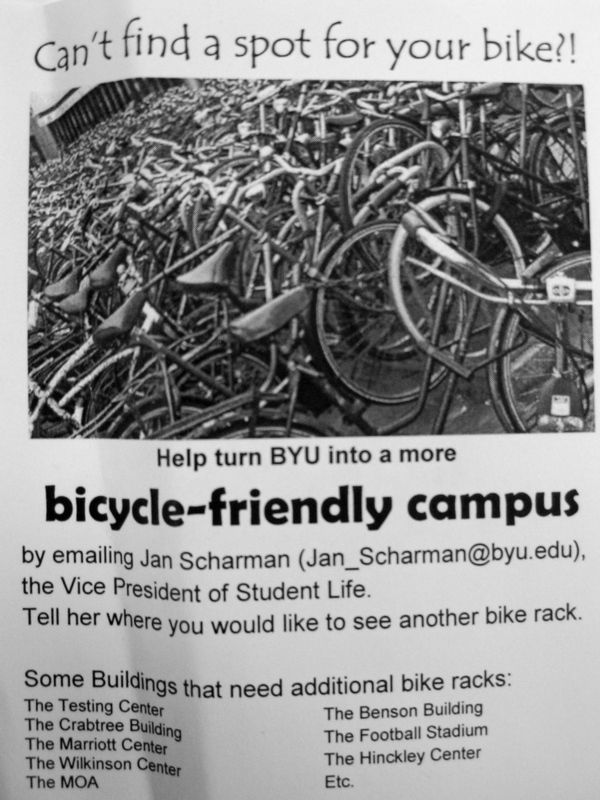 A local bike activist and student passed out these fliers around campus and had the opportunity to meet with Carri Jenkins (Assistant to President Samuelson). 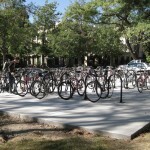 There are currently 6,000 bike slots and they are currently in the process of locating more places for bike racks. In comparison, there are 7,142 Y-Lot parking spaces for cars on campus. 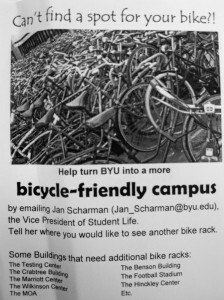 grassroot efforts to make BYU a more bicycle-friendly campus. 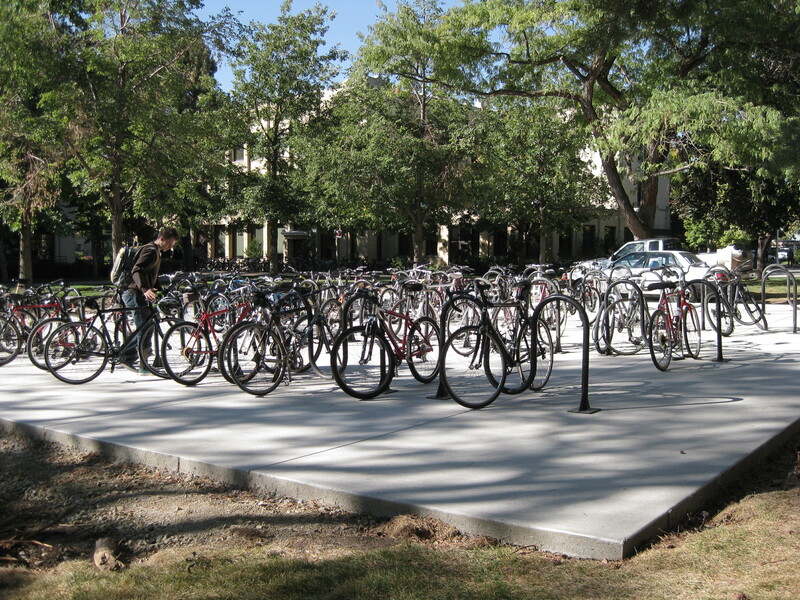 BYU has pledged to put up more bike racks, and here is a photo of one of the new locations with 100 new slots for bikes (between the JSB, MCKB, and the Brimhall). 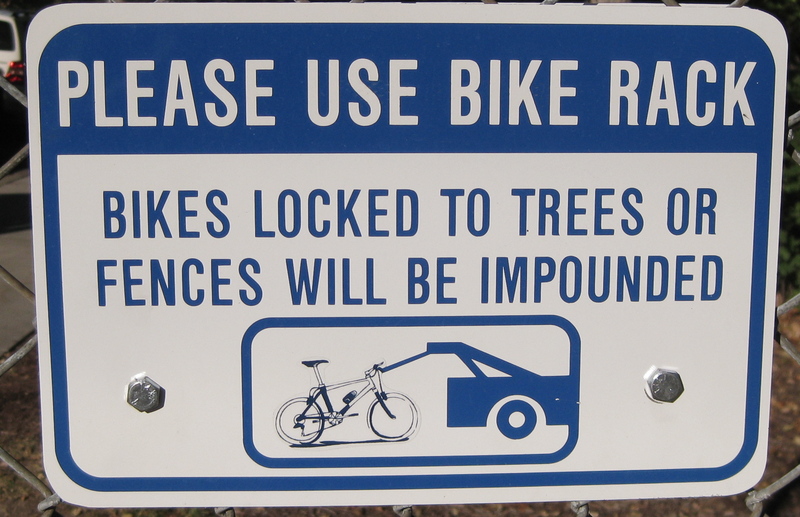 This is on a fence on 800 N near the duck pond. 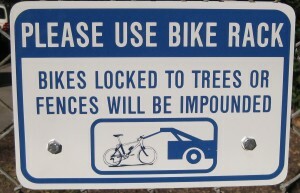 I can’t wait to see them tow a bike like that. And the detail in the bike: water bottle, de-railer, they mean business. This entry was posted in University Bike Scene by Carol Ann. Bookmark the permalink. Carol Ann is a BYU grad student, studying Teacher Education and working part time at a local charter school. A bike enthusiast, Carol Ann grew up riding bikes with her family and to summer swim team every day in her hometown Boise, Idaho. She hopes bikes will have a safe existence in Provo and with better relations between bikes and cars. Carol Ann rides her grandfather's '70's blue Schwinn cruiser bike and a burgundy Peugeot 10-speed. You can spot her a mile away with her baby blue helmet. She claims she wears it to honor her parents. 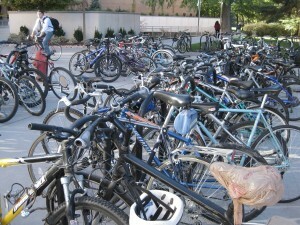 Wow – I can’t believe the racks are so full at BYU! I think that’s definitely good news for the cycling community. Thanks for the update Carol Ann!